Monism comes from Greek monos meaning single or alone. A person practices monism. Monasticism is institutional monism and happens in monasteries, which are places where individuals practice monism. A monk can be a hermit if he's actually off alone somewhere (sometimes with a support staff) or a cenobite if he lives together with like minded others in a community. ("Hermit is derived from Greek, eremos, meaning "alone". "Cenobite" is derived from Greek, koinos bios, meaning "common life".) It's the cenobitic communities that are usually called monasteries, and the degree of solitude or "togetherness" can vary greatly -- groups of hermits living near each other and sharing some religious activities might be called a monastery. A monk can be a priest but he doesn't have to be one: Clerical or Holy Orders are entirely separate, and in medieval times were only available to men -- the female deaconate had already been suppressed. Monks who are priests are usually called "Father" in Catholic circles. (Monks who are not priests are called "Brothers" or "Friars", the female equivalent being Sisters or Sorors). Monks can become Priests or can be named or elected to Higher Orders, i.e., they can become Bishops, Cardinals, even Popes, so "chains of command" (see below) can develop twists or loops. A rule is just what it sounds like -- a behavior guide to persons who want to live as monists. Rules can, but don't always, contain sections that are mandatory or that make the whole rule mandatory -- if there are mandates, you must follow the rule to be in an Monastic order, which is, of course, the (figurative or literal) community of all those that subscribe to that "rule". Each order has its own rule although many of them are derivative. Someone who lives under a rule might be called a canon (from Latin, canon, meaning "a rule") or a regular (also from Latin, regula, also meaning "a rule"). Sometimes they are redundantly called cannons regular. A rule had to be approved by higher authority (like a Bishop, a Pope, or a Patriarch). Some orders take vows, which are solemn promises to God. The most common vows are poverty, chastity, obedience, stability, and silence, but not all orders take all of them (or even any of them). Poverty, chastity and silence are easily understood -- common definitions apply. ends at the Pope in the Western church. You were OK if you obeyed your own immediate superior, even if he wasn't obeying his -- eventually, there were courts and tribunals, etc., to sort things out. Stability means staying in your assigned place. You need release from your vow to move to another location. Stability, in some orders, is subsumed in obedience -- no separate vow or release needed. A person who binds himself or herself with vows is known as a religious, and that word comes from Latin, religare or ligare, meaning "to bind" and "to tie" respectively. A male religious is a monk and a female religious is a nun (from Late Latin, nonna, feminine form of nonnus, = "teacher", "tutor", or "monk" -- and it is the same root as for the Italian words nonna meaning "grandmother" and nonno meaning Grandfather). There were (almost invariably) completely separate (but possibly associated) Monastic orders for women, but they were always, in some way or another, subject to males and usually at a fairly low level -- heads of female local communities would most often have males as their immediate supervisors (if not as their formal superiors). In Western monasticism (i.e., after Benedict promulgated his rule) female communities lived separately from male communities, but perhaps right next door or on the same compound. In some cases there were "First Orders" for men, "Second Orders" for women, and "Third Orders", with much relaxed rules, that accepted both. Military Orders combine some aspect of "soldiering" or guarding (e.g., the Templars) or care for military people or for pilgrims (e.g., the Hospitalers) with a Monastic rule or life-style. Military orders still exist, but most often as charitable or service organizations with relaxed monastic rules. This definition process can get a lot more detailed, but we don't need it for our purposes. In fact we probably don’t need most of the above -- it's "nice to know" information, not "need to know." Some History: Monasticism is ancient, having existed in India almost 10 centuries before Christ. It can be found in some form among most developed religions: Judaism, Hinduism, Buddhism, Jainism, Taoism, the Sufi branch of Islam, and Christianity. There were "priesthoods" in the Mediterranean classical world, some of which practiced hermetic or communal living and asceticism (Orphics, Pythagoreans, Gallae, etc.). In the time of Christ, the permanent or temporary hermetic Jewish tradition was already well established, and there also were already Jewish cenobitic communities in the valleys leading down to the Jordan Valley and in the deserts. Some of these communities converted to Christianity early on, and there are pre-Christian structural foundations and structures within and under some current buildings. Christian monasticism is usually said to have begun with St. Anthony of Egypt (usually called "The Great" in the Eastern tradition) who is sometimes called the first Egyptian hermit in the early 4th century AD. Anthony was active in a hilly area above the Red Sea where Jewish ascetic hermits called Therapeutae were already established. St. Pachomius is said to have founded the first of the cenobitic communities, on an Island in the Nile River in the second quarter of the 4th century and to have prepared the first known monastic rule.. St. Basil (the Great), the Bishop of Cesarea, urbanized monasticism by introducing charitable service in towns as a work discipline. Despite the "first" designation attached to these persons, it is clear that they were following established traditions, some of which were already being followed by Christians. The Cenobites, in particular, were sometimes merely emulating life in the earliest Christian communities. The beginning of Western Monasticism is often credited to St. Benedict of Nursia (6th century) whose Benedictine rule was the basis of most monastic life until the 12th century. But it is historically documented that Athanasius established cenobitic communities in Italy, Augustine in North Africa, and Martin of Tours in Gaul -- all before Benedict. The Carthusians (11th century), Cistercians (11th), Premonstratensians/Norbertines (12th), and Cistercians (12th) followed modified Augustinian or Benedictine rules. The big Military Orders were formed about the same time (Hospitalers 1070, Templars 1118). The Dominicans, Franciscans, and Carmelites (13th century mendicant orders, the first two in Italy and the third in the Holy land) followed different rules as did the Counter Reformation Jesuits (1540). The first nuns are thought to have been Christian Roman widows who decided not to remarry, i.e., univirae (thereby retaining their inheritances). It's established that many early Christian "home churches" in Rome were founded by Christian widows. or use the Google Search engine to look up "monasticism" or any of the other terms defined above or the names of the religious orders. Once again, we can't cover everything and everyone, so we will discus some (mostly) Italian or Rome connected exemplars. What we know about Anthony, we get from a biography of his written by Athanasius, one of his disciples (yes, the same one who predated Benedict in Western monasticism). After the standard "inspiration" (hearing a sermon on "selling what you have and giving to the poor" Matthew 19:21), he started an ascetic life (after first providing for his orphaned sister -- a nicety that some others neglected). He sought a hermetic retreat, but soon attracted a multitude of followers who he taught. Anthony is said to have introduced manual labor to the contemplative life, so as not to neglect societal duties. When the local Roman governor started a persecution of Christian around 300 AD, he abandoned his solitude to minister to prisoners in Alexandria until the persecution ended. He had another Alexandrian period when he preached against Arianism in support of Pope Athanasius (not the same Athanasius who wrote his bio). He had no formal monastery or written rule -- only the informal rule of prayer and manual labor. The St. Anthony Monastery, which is still in use was founded by his disciples. Before his death, Anthony specified a secret burial so his body would not become an object of veneration. The Athanasian biography of Anthony was very popular and was instrumental in spreading the idea of monasticism in the Christian world. Pachomius who founded the Nile Monastery was a disciple of Palaemon who may have been a disciple of Anthony. The Pachomius rule, perhaps the first of its kind, was very influential, and experts have found 32 direct parallels with Benedict's later rule. A purported translation of the Pachomian rule is in the writings of Jerome, but it is not accepted by all experts as being solely his work. Benedict's biographer was Pope Gregory 1, the Great, who was himself a monk and, perhaps, a Benedictine -- if not, he was certainly influenced by Benedict. The Following information about Benedict and Scholastica has Gregory's bio of Benedict as its ultimate source. Benedict had a twin sister, Scholastica, and was born into the Roman noble family that governed Nursia. About 500, he went to Rome, but a short time later, he joined a group of virtuous men at Enfide. His supposed first miracle (fixing a pot his former nurse broke) occurred there. Shortly thereafter he sought solitude in a cave near Subiaco, a few miles form Rome, to escape the notoriety of his miracle. After three years he agreed to be Abbot of a local monastery, but he was too rigorous for the monks who tried to poison him. He returned to his cave. Many miracles followed and disciples gathered around him. He founded 13 monasteries in the Subiaco Valley, each with 12 monks. 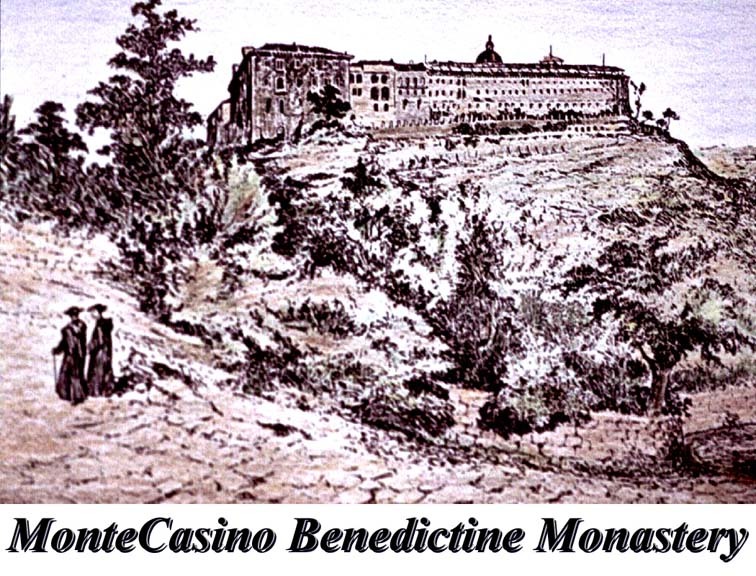 About 529 he started the Monte Casino Monastery on the site of a Roman temple that he and his followers destroyed. Between the foundation and 543 he wrote the Benedictine Rule. In 543 (the only sure date in his chronology) he rebuked the Gothic King Totila for cruelty and Totila reformed. Probably the same year he had his famous vision of Christ, after which he announced his impending death. He died six days later and was buried in the same grave as his late sister, Scholastica. Some sources claim their bones were "translated" to the Abbey of Fleury (near Orleans), but the Monte Casino monks still claim to have the bones. Dominic Guzman (1170? - 1221) Dominic had no definitive contemporary or near contemporary biographer -- his bio is a later reconstruction. Castilian Spanish nobility, but not royalty, he was born among portents and prophesies of greatness. His mother was said to have dreamed of a dog running with a torch in its mouth before his birth (giving rise to the Dominican logo and to the fractured Latin satirical nickname applied by the Fransiscans, "The Lord's dogs", Domini cane. His mother (who was clearly excitable) also said she saw a light in Baby Dominic's breast at the moment of baptism. At age 14 he began a 10 year education at the University of Palencia -- not an unusually long time since Spanish universities of the day included everything from High School through the doctoral dissertation. He was a serious student and didn't participate in the famous dissipation of the Spanish universities. While still a student he assisted in the reform of the Chapter of the Bishop at Osma bringing the other members under a monastic rule. In 1201 he became Prior at Osma. While on a diplomatic mission for the King of Castile in 1203, he decided to form a new monastic order which would have the express purpose of Preaching against the Albigensian heresy. By the end of 1204, Dominic was in Rome, and shortly thereafter he was deputed by the pope to go to Languedoc to help the Cistercians against the Albigeois Cathars. Dominic saw that the Cistercians were making little progress because of their own indulgent habits. After persuading them to reform, they began to make progress. Theological disputation was a key method of addressing the Albigenses for which Dominic was well suited. He also saw the need for non-heretical convent schools to combat the Albigensian institutions already in existence and it was to these convents that he offered his Second Order rule. Dominic participated in the bloody "Crusade against the Albigenses" (begun 1208) after a Cistercian legate was killed, but was said to have tried to mitigate the butchery. According to legend (although his presence is not supported by historical analysis) Dominic tried to intercede for women and children during the massacre at Beziers. It was said that Dominic followed, rather than traveled with, the crusaders, offering "succor and salvation" in their wake. Whatever the circumstances, the crusaders appear to have considered his presence miraculous and necessary for their victories. It is sometimes said that Dominic founded the Inquisition at this time and that he was the first Inquisitor. It's clear, however that the Inquisition was already at work at least a decade before Dominic's arrival in Languedoc. It's also clear that he participated in the Inquisition while there. Dominic turned down several offers of Bishoprics in succeeding years and in 1214 he proposed a rule for himself and his followers -- this was the "First Order" rule. The 1215 Council of Rome decided on a mission similar to that which Dominic envisioned for his order -- preaching against the heretics -- but said that no new rule should be promulgated. Dominic therefore chose to use the loosely written Rule of Augustine and the "Order of Preachers", commonly called the Dominicans, was formed. Thereafter Dominic and his "preachers" spread out into various parts of Europe. It was averred by the Church that Dominic personally brought more than 100,000 heretics back into the fold with his preaching and miracles in Lombardy. During this period, he formed the "Militia of Jesus Christ" as a third "Dominican" order. Dominic died in Bologna in 1221 after a short illness. Dominic is one of the Church's most controversial monastic founders. His participation in the Crusade against the Albigenses and the formation, if not foundation, of the Inquisition have seriously called his sanctity into question, especially, but not exclusively, among non-Catholics. Dominic and Francis of Assisi were contemporaries and both Dominican, and Franciscan lore maintains that they met and knew each other. There are numerous artistic renderings of their supposed meetings. Francis of Assisi (1181? 82? - 1226) Son of a cloth merchant and "Lady Pica" a (possibly French) minor noblewoman whom he met on one of his business trips. Baptized as "Giovanni" in his father's absence -- another business trip -- but renamed Francis on the father's return. He could read and write Latin, spoke French (perhaps imperfectly) and read French literature, enjoyed the works of the Provencal troubadours. He had a spirited, but apparently not a sinful youth (it would have been remarked later if he had) and was a leader of Assisi's young men. In 1202 he was captured and imprisoned while fighting in a "war" between Assisi and Perugia (both small towns, so probably not much more than a skirmish) and kept in a Perugian prison for almost a year. He was apparently released because of illness. Cutting short his convalescence, he was en route to join papal forces fighting against Frederick 2 in Apulia (1205) when he had a dream or vision that prompted him to return to Assisi. There he retreated to solitude, fasting, and prayer waiting for God's further instructions. (Another "holy anorexic"?) Within a short time there were more dreams. After experimenting with pretended poverty in Rome, including the famous episode of kissing the leper, he returned to the Assisi area where he had his most celebrated vision: the crucifix at the San Damiano chapel outside Assisi spoke to him telling him to "repair my house." Francis took this as a command to rebuild churches (rather than to restructure "The Church"). He went to his father's warehouse and rode off with some expensive cloth, which he sold along with his horse and tried to give the money to the rector of San Damiano. The rector refused the money -- perhaps realizing the circumstances -- and Francis discarded the cash out the window. Francis's father, not amused by the episode, locked Francis in the house and brought a civil suit to restrain him. Francis didn't answer the summons so the Father brought him before Assisi's bishop. At the audience with the Bishop, Francis stripped himself naked and renounced any connection with his family. The bishop covered him with a cloak and Francis fled for the woods above Mt. Subiaso above the city. Eventually he came down, but not back to his family. He preached and begged in Assisi without license, and gathered followers, some of whom were wealthy. Francis used their money to repair and rebuild neglected chapels and churches. Eventually large numbers of followers gathered around him and started to build the huge church and monastery which is still in the town. Papal sanction for the "Order of Friars Minor", commonly called Franciscans, was granted. In subsequent years Francis traveled, including a purported trip to Egypt (1219) where he went into the camp of the besieged Sultan at Damieta. According to legend the Sultan was so impressed that he allowed Francis to visit the Christian holy sites in Jerusalem. Whether or not the visit to Jerusalem actually took place, shortly thereafter, the Muslim authorities granted custody of all the Christian sites in the Holy Land to the Franciscans. The "Custos", a Franciscan appointed by the Order, technically still maintains the custody of all the Christian sites in the Middle East. On his return, Francis was faced with an organizational crisis. All three Fransican Orders had grown dramatically but their administration hadn't kept pace. There were at least two new revisions of the rule, and Francis appointed administrators to run the organization. The second revision won Papal approval, and as the "Regula Bullata" (Rule with the Papal Seal) it still is used by the Franciscans. From that point onward Francis withdrew increasingly from the administration of the Orders. In 1223 the first "nativity scene" or crèche was erected in Assisi. Although it is commonly thought that Francis invented the idea, It is clear from his own writings that he had duplicated what he had seen in a nearby town. Nonetheless, it was Francis's personal popularity that spread the practice of setting up Christian nativity scene crèches first in Italy, then Europe and then around the world. The next year he was said to have received the stigmata (September 14, 1224), which he carefully hid during his lifetime. The wounds were reportedly discovered after his death. Francis died in 1226 after a two year illness that included blindness from disease apparently contracted during his Middle-East travels. Many people today have extreme doubts about the miracles, visions, and stigmata -- Francis would probably be institutionalized or at least "de-programmed" today. But the doubts are essentially irrelevant, because his effect on Roman, Italian, and European (and later, "New World") thought and behavior depended on what his contemporaries thought, not necessarily on reality. And his contemporaries almost universally believed all the stories. The Basilica of St. Francis in Assisi houses some of Italy's best and most important art in the form of fresco cycles by Cimabue, Giotto, and Cavalini. There is some dispute about who painted what, but these three artists together are credited with revolutionizing Italian art by restoring the "classical" use of perspective and reintroducing the concepts of the "vanishing point" and "double perspective" and ending the flat and un-natural late Byzantine conventions. The 1997 earthquakes damaged some of the frescoes, but the fabric of the church was remarkably stable, perhaps due to steel girders added between the round tower buttresses after the previous serious earthquake in 1984. The cylindrical buttresses themselves also were studied carefully both in 1984 and in 1997: it appears that they may be better suited to withstand the twisting and rolling motion of earthquakes in mountainous regions than are buttresses with square or rectangular cross sections. Reconstruction after the 1997 quakes included adding more flexibility and strength to the fabric as well as removal of extraneous structures that had been built onto the outside of the basilica. Fund-raising for the post-earthquake reconstruction was so successful that the Franciscans were able to share some funds with other damaged towns. Nonetheless there is lingering resentment that much money was collected for rebuilding churches (the original Franciscan goal) and not enough for housing renewal. See https://www.csicop.org/si/show/padre_pio_wonderworker_or_charlatan for the 20th century fraudulent stigmatic, Padre Pio. Ignatius, by his own account, knew he could no longer be a military officer so he decided to be a Saint. He set off for Jerusalem, but didn't even get as far as Barcelona before he collapsed from exhaustion and effects of his wounds. He stopped to rest for a few days (in a cave, of course) but stayed for ten months during which he had a series of visions. During this time he determined to found his own religious order. Ignatius wrote no rule and, controversially, proposed doing away with the fixed order of daily prayers (the "office") that had been a fixture of monastery life. He finally arrived in Rome where he met Pope Adrian 6 and then set off for his pilgrimage to Jerusalem with the Pope's blessing. He wanted to remain in the Holy Land but the Franciscan Custos ordered him out because of the dangerous security situation. Ignatius left, but only after the Custos threatened to excommunicate him if he stayed. Now aged 33, he went back to school to learn Latin and other subjects to prepare for the priesthood. He was soon in trouble with the Inquisition and was imprisoned twice, first in Barcelona and then in, Salamanca because he insisted on teaching and preaching before he was ordained. He left Spain for the freer air of Paris, and at Paris University he gathered a few disciples including Francis Xavier and Peter Faber. Eventually Ignatius and five others took vows of poverty and chastity (notably, not obedience) in a private unsanctioned ceremony and decided to go to the Holy Land or failing that, to Rome where they would put themselves at the Pope's disposal (not as a religious order, but as individuals). They waited for a year in Marseilles, but because of continuing war between Christians and Muslims, there were no ships to the Holy Land. During that year he was ordained, but didn't say his first mass, apparently wanting to do that in Jerusalem. Finally giving up the wait, he and two others set off for the Roman alternative plan. En Route, at La Storia, a few miles north of Rome, Ignatius had another vision confirming that Rome should be his real destination. Once in Rome (in 1538) the Pope gave all three work teaching scripture and theology and preaching. The next year Ignatius called his other companions to Rome where they decided to live communally under obedience to the pope and a "superior general" and put themselves again at the disposal of the Pope. In addition to their previous vows of poverty and chastity and the new vow of obedience, they also vowed to go wherever the Pope sent them and on whatever mission. Ignatius lived simply and asked only for a small pre-existing church in Rome's red light district, which the Pope cheerfully granted him. Soon his preaching and that of his colleagues attracted large audiences along with donations to build a larger church, The Gesu, adjoining the original small church. During the lifetime of Ignatius decoration of The Gesu was kept simple. Their most intensive work was in the orient, however, where they had great success under the guidance of Francis Xavier. Some modern scholars, including some eminent Chinese Confucianists, believe that the Jesuits in China were the real authors of the Confucian Analects -- this is known as the "Neo-Confucian theory": that there was a real minor Chinese philosopher named Confucius, but that the Jesuits invented the Analects in his name to prepare the Chinese for conversion to Christianity. After Ignatius died, the Order redecorated The Gesu in grand style. It is truly Rome's first and one of its greatest Baroque churches. It's architects included Michelangelo, Vignola and Giacomo della Porta who designed the first Baroque (or at least "proto-Baroque) façade. Giambatisa Gaulli (known as I Baciccia) did most of the interior including the "multimedia" vault of entitled The Glorification of the Name of Jesus, which includes the central fresco augmented by hanging stucco angels and oil paintings on suspended cloud-shaped wooden panels. Centuries of urban grime, candlewax soot, and pilgrim sweat were removed from the interior just in time for the 2000 Jubilee year. The main altar is richly decorated, but it pales in comparison with the altar dedicated to Ignatius, made of gold, silver, and, legendarily, more than half of the known lapis lazuli stone in the world. The lapis globe that tops the altar, held in the hand of the Father in Pierre Legros' Trinity, is supposedly the largest single piece of lapis lazuli ever carved and displayed. More info on the church is at https://en.wikipedia.org/wiki/Church_of_the_Ges%C3%B9. Military Orders -- Templars and Hospitalers Both of the major orders and several smaller organizations combined military and monastic rules and responsibilities. The Templars were founded in late 1119 or early 1120 by French knights who vowed to protect Pilgrims on their way to Jerusalem. King Baldwin 2 of Jerusalem gave them quarters on the side of his Jerusalem Palace nearest to Temple Mount and from this they derived their name. (By that time Temple Mount was already occupied by a Mosque.) According to legend the Templars kept their horses in the vaults below the Al Aqsa Mosque, now known as Solomon's Stables. Originally, the Templars vowed obedience to the Latin Patriarch of Jerusalem, but in 1139 Pope Innocent 2 preempted that authority and took direct control of the order with no responsibilities to bishops in whose dioceses they might reside or hold property. This allowed the Templars to diversify rapidly and the order, according to some sources, soon became a cover for commercial, banking, and real estate transactions. Not surprisingly, vast wealth was accumulated. There was great rivalry between the Templars and the Hospitalers and by the late 13th century proposals were made to merge the two orders. However, after the fall of Acre, the last Crusader stronghold in the Holy Land, the proposals were dropped: the Templars no longer had a legitimate mission. On October 13, 1307, Philip 4, The Fair, of France arrested all the Templars in France and seized the assets of the Order. Under pressure from Philip, Pope Clement 5 (also a Frenchman) ordered the arrest of all Templars everywhere. Under continuing pressure from Philip, the Pope completely suppressed the Order on March 22, 1312, and Templar properties were either given to the Hospitalers of seized by the state. In the suppression, many Knights were imprisoned or executed, and on March 18, 1314, the last Grand Master, Jacques de Molay was burned at the stake in Paris. Modern Masonic organizations claim to be descendant from the Templars. The Hospitaler Order originated at an 11th century hospital founded by Amalfi merchants in Jerusalem to care for sick pilgrims. (Similar foundations were appearing in Rome at the same time.) In 1099, when the Christian crusaders conquered Jerusalem (with a bloodbath of Muslims and Jews) the order rapidly increased its activities both in the Holy land and along European routes to Jerusalem. They founded hospitals in southern France and in Italy, usually in port cities. The Order received papal approval in 1113, and in 1120, Raymond de Puy, its second Superior, substituted the Augustinian Rule for the Benedictine. The Hospitalers quickly acquired wealth and power and gradually took on a military role in the Holy Land, where they previously had only offered health care and hospitality for indigent pilgrims. Their military power was second only to the Templars. When Jerusalem was recaptured by the Muslims (1187) the Hospitalars began their long withdrawal, first to Margat and then to Acre in 1197. In 1291 Acre fell and the Hospitalers moved to Limassol in Cyprus. In 1309 they acquired Rhodes, and there they organized a naval (i.e., pirate) force to prey on Muslim shipping, which the continued to do for more than two centuries. By the 15th century the Turks had taken over most of the Islamic middle East and Suleyman, The Magnificent (a Kurd who led the Turks), had had enough. He besieged Cyprus in 1522, and on January 1 of the next year the Knights evacuated Rhodes with as many of the Christians who wanted to accompany them. After seven years of homeless wandering, the Hospitalers were granted Malta and several surrounding islands by the Holy Roman Emperor, Charles 5. (This was just three years after an out-of-control imperial army had sacked Rome in 1527, and the settlement of Malta on the Hospitalers was apparently port of the Emperors atonement.) The Hospitalers continued to harass Muslim shipping from their new base. In 1565 the Knights successfully defended Malta from a siege by Suleyman, and in the process destroyed most of the Muslim war fleet. What was left of the Turkish navy was permanently crippled a the Battle of Lepanto in 1571. The Hospitalers participated in the battle along with the fleets of other Christian European powers, and each and every one claimed responsibility for the Christian victory. They were finally ousted from Malta by Napoleon in 1798 -- Malta was a side issue to his conquest of Egypt. The 1802 Treaty of Amiens gave Malta back to the Hospitalers, but they weren't able to actually retake possession, and the 1814 Treaty of Paris took it away from them again. For a long time, they were dispersed and without a Grand Master, but Pope Leo 13, reinvigorated the order and appointed a new Grand Mater in 1879. (This was partially in response to events in Italy where the Papal States had finally been absorbed in 1870 and the new Italian Government was moving into Rome. The Italian Government quickly co-opted the Knights however by granting the Knights some extraterritorial properties in Rome where the Knights set up the Sovereign Military Order of Malta (S.M.O.M.) The Knights adopted a new constitution in 1961 along with the Order's most recent new formal name, "The Sovereign Military Hospitaller Order of St. John of Jerusalem" -- They still use SMOM on their vehicles and informal letterheads in Rome. The Hospitalers still maintain a large hospital, specializing in ophthalmology, in Jerusalem and they have health facilities and clinics in some third world countries. Note: both Military Orders suffer from a huge amount of fakery, fraud, chicanery, and outright ignorance on the Internet. The links below are legitimate, but they may link to other web sites where you can quickly slip into the realm of the absurd. Caveat lector!